The Lemur Conservation Network member of the month showcases our members’ work, and shares how we can help them in their battle for lemur conservation. The month of March is dedicated to AEECL. In this blog post, we interviewed representatives of this NGO who tell us all about their important work and how we can support them. 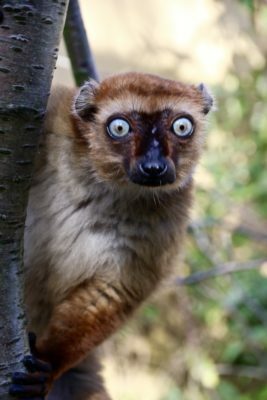 The Lemur Conservation Association (AEECL) is a charitable non-governmental organisation run by a consortium of European zoos, working for Madagascar’s highly endangered lemurs through cooperation with the Malagasy people. The charity was established in 1989 by the founder members: Zoo Mulhouse, Zoo Saarbrucken, Zoo Cologne /Koln and the University of Strasbourg. The Sahamalaza region has been the focus of scientific and conservation interest for the AEECL since 1989. 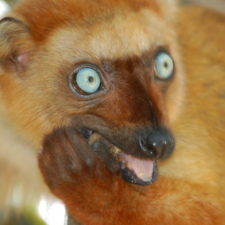 The critically endangered blue-eyed black (Eulemur flavifrons) is endemic to this part of Madagascar, and has been selected by AEECL as the flagship species for all conservation efforts concerning the region. For many years AEECL, with the Malagasy protected areas authority (MNP), worked towards the implementation of a national protected area on the Sahamalaza Peninsula. Our first goal was reached in 2001, when UNESCO declared Sahamalaza a biosphere reserve. The region was finally declared a National Park in June 2007. The AEECL aims to protect the habitat and ecosystems within the Sahamalaza peninsula, monitor and increase lemur populations and be a strong conservation ambassador for the area. To achieve this, we invest in local communities through education, resource management and communication, to ensure the communities of today can forge a safe haven for wildlife tomorrow. 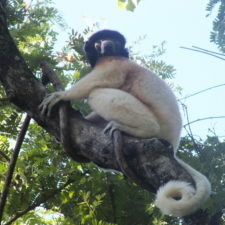 The AEECL is based within the Sahamalaza National Park in Madagascar. 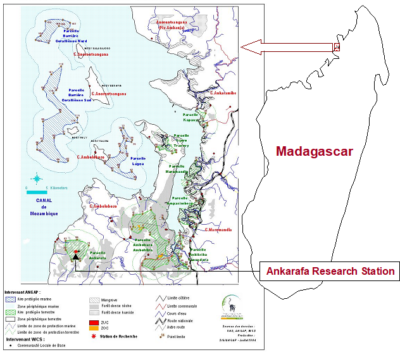 There is one research station and a tourist camp in Ankarafa, a base situated in Antsohihy and an office in Antananarivo, which is the capital city of Madagascar. 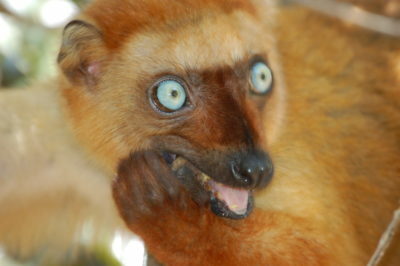 The flagship species for the AEECL is the blue-eyed black lemur (Eulemur flavifrons), endemic to the area and critically endangered. We also focus on the two other lemur species found in the Sahamalaza region, the Sahamalaza sportive lemur (Lepilemur sahamalazensis) which is also critically endangered and the Sambirano mouse lemur (Microcebus sambiranensis) which is classed as endangered. 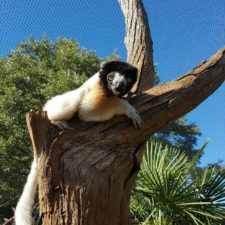 How does AEECL help lemur conservation? 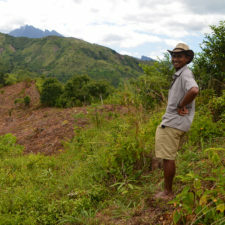 Unfortunately forest fires are common throughout Madagascar and can cause much devastation so the AEECL are pro-active in preventing the spread of these fires and are passionate about educating local communities about the importance of environmental protection for the surrounding ecosystems. To help prevent the spread of fire outbreaks, the AEECL joins forces with local villagers, local government and other organisations annually to establish firebreaks around the forests. These firebreaks are vital to protect the forests and the wildlife within. The last firebreak working party took place in August 2017, was attended by 860 people and 7km of firebreaks were established. The AEECL are also heavily involved in reforesting areas affected by fire outbreaks and planting areas that could reduce forest fragmentation and to provide a long term resource for villagers. 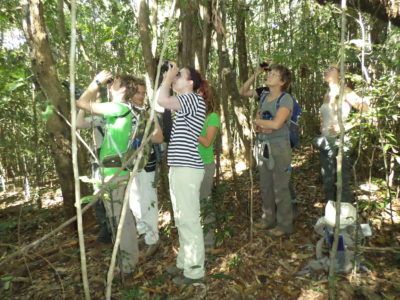 A vital part of the work of the AEECL is to monitor the lemur numbers and research the local ecosystems to have a better understanding of the pressures faced by these habitats. 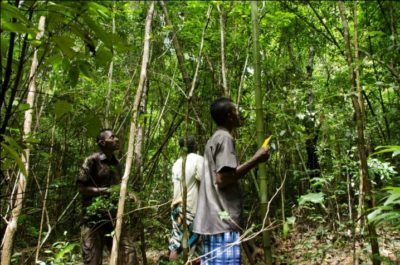 Local villagers are employed as Research Assistants who are all trained to use GPS tracking devices and record lemur numbers, behaviours and patterns. The AEECL has a long established research station in Ankarafa and is currently building a 2nd station in another forest area. Research students are present for much of the year with students frequently coming from Europe but they must team up with a Madagascan student to ensure in country capacity building. 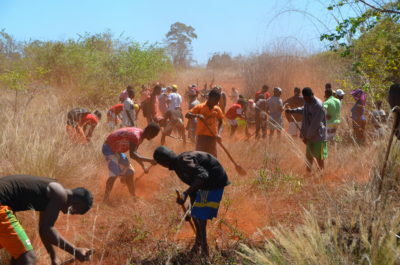 As part of the community inclusion, the AEECL takes part in and helps to co-ordinate many local environmental festivals, workshops and meetings such as the local Lemur Festival held in September each year and World Environment Day. The AEECL also applies to various conservation organisations for grants for differing work projects. In 2016, they were awarded a grant from the IUCN ‘SOS – Save Our Species’ initiative, which gave the opportunity for increased field work, the employment of more rangers and more education opportunities for local children. To build greater bonds with the local villages the AEECL look to support people in their everyday lives. This has involved such projects as building new wells for fresh water, providing solar energy panels, increasing employment opportunities, supporting tree nurseries for reforestation work and improving agricultural techniques. 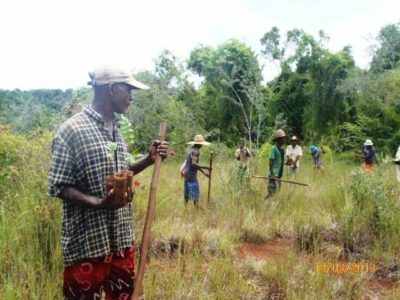 Madagascar is a diverse, beautiful and unique country and ecotourism is a positive way to support conservation, through the education of tourists, employment offered to the local communities and funding received for conservation activities. In conjunction with a Dutch travel company, several visits have already been undertaken and are planned for the AEECL tourist camp based in Anakarafa. The tourist camp has undergone much improvement over the past 12 months, including new tents, new toilet facilities and utilising the local villagers’ skills to provide services for the tourists and traditional Madagascan entertainment. The AEECL believes that supporting the local communities is vital to ensuring the future for the wildlife and forests of the Sahamalaza peninsula and a good proportion of staff time and funds are utilised to improve the education system of the communities local to our work. To help, each year, AEECL sponsors 50% of the salary for 70 teachers to alleviate financial pressures on communities. There is an active and evaluated education programme with a strong message about environmental issues. AEECL funding partners kindly offer scholarships to students to encourage them to finish school. 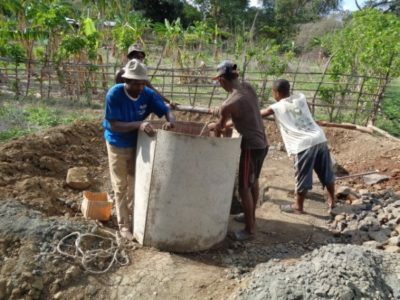 Many schools have been renovated and in the past few months, the AEECL have finished constructing its 2nd new school in the village of Ambinda. In October 2017 the AEECL were greatly honoured to receive a visit from HRH the Princess Royal from the UK and the President of Madagascar, Hery Rajaonarimampianina. The President of the AEECL Gary Batters, the Vice-president Christoph Schwitzer and the AEECL Programme Director Guy Randriatahina were all present to meet the royal dignitaries and show them around the research station and the surrounding forest and have a good look at the critically endangered blue-eyed black lemur (Eulemur flavifrons). 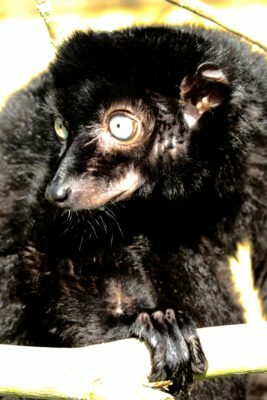 Our goal is to save these critically endangered lemur species from extinction and we know that without AEECL intervention this forest and all it’s incredible biodiversity would be destroyed. It is vital we continue to receive support so we can carry on meeting our core values, such as supporting the local communities, improving the education system and further develop school facilities. We are also focusing on developing our ecotourism programme and improving reforestation techniques. Do you have volunteer opportunities at AEECL? Volunteering opportunities are currently limited but we do have many research opportunities and students are encouraged to apply. To ensure we can carry out all of our core work we rely on donations and member subscriptions. We need to continue to ensure we support the local communities and empower them to further protect the forests and the plants and animals that live there. We need to progress a culture change within the communities in the Sahamalaza National Park, educate the younger generations and provide employment opportunities for villagers. Donations we receive go towards developing this support, be it through building new schools, subsidizing teacher salaries, creating jobs through ecotourism, providing fresh water and solar power to villages and reforesting barren areas. Contact AAECL by email to learn more about donating.